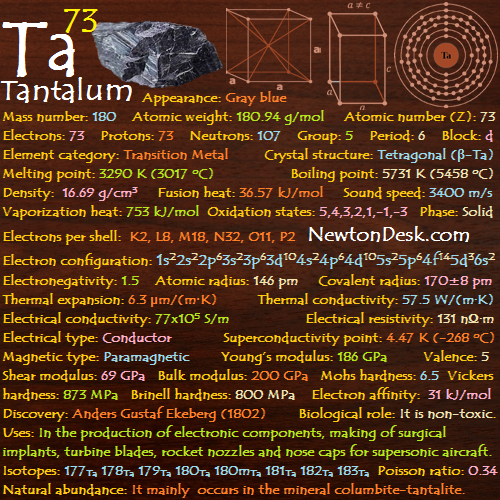 Pure tantalum is soft, shiny, silvery metal, and impure metal is gray, heavy, and very hard. 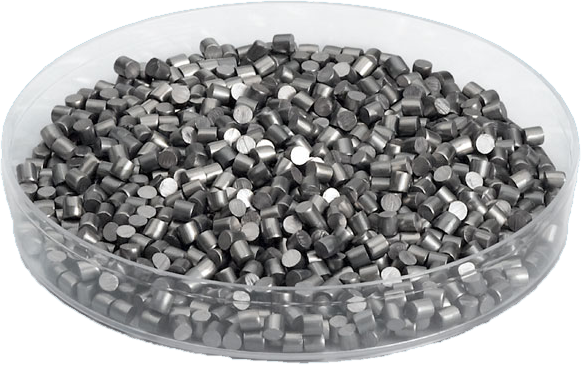 Tantalum is resistant to corrosion due to an oxide film on its surface, which is stable and also have good rectifying and dielectric properties. It is almost immune to chemical attack at temperatures below 150 oC, and is attacked only by acidic solutions containing the fluoride ion, hydrofluoric acid (HF), and free sulfur trioxide (SO3). It is much more reactive at high temperature. It doesn’t react with air and water under normal condition. 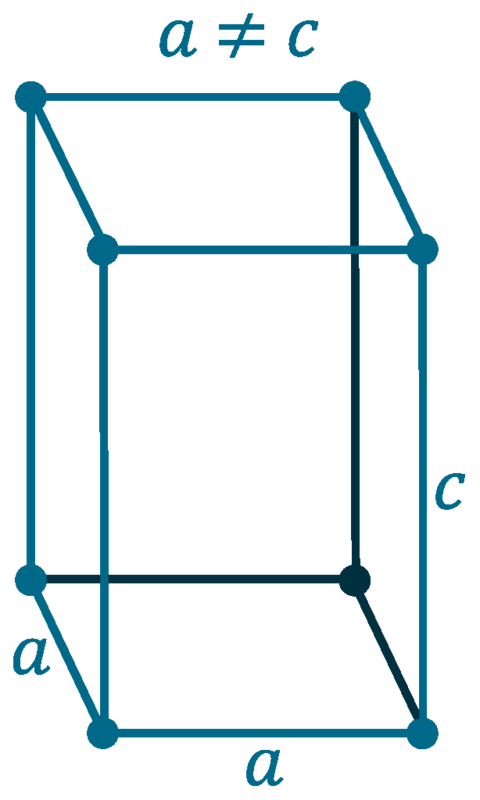 Reacts with halogens upon heating, and forming Tantalum (V) halides. Naming: From king Tantalus of Greek mythology. 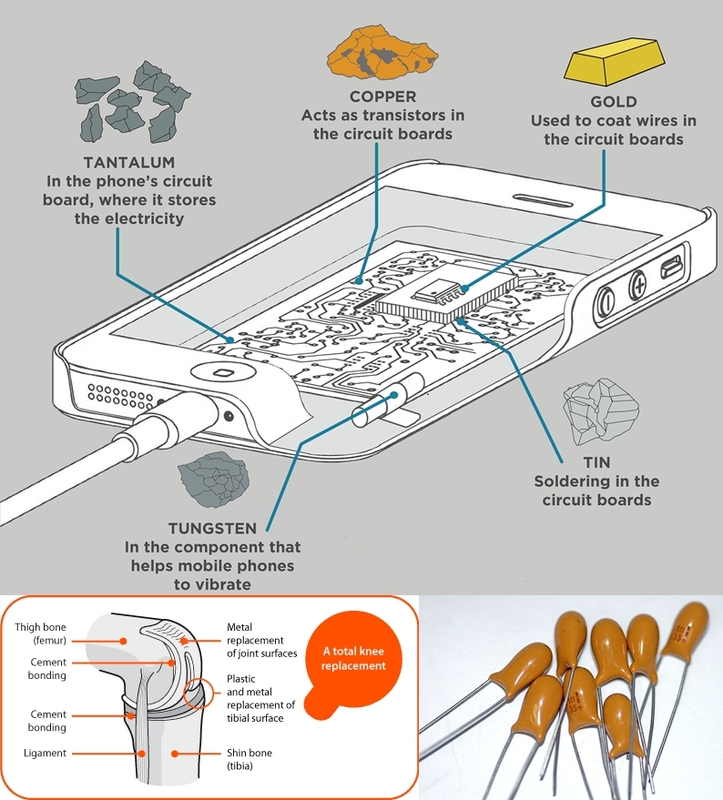 Tantalum is mainly use in the production of electronic components, because the oxide layer which forms on the surface of the metal, that can act as an insulating (dielectric) layer. It can be used to coat other metals with a very thin layer, to achieve the high capacitance range. Today, Tantalum capacitors is used in many electronic equipments, such as DVD player, mobile phones, computers etc.. The metal is highly biocompatible (completely immune to body liquids and is a nonirritating material), therefore it is used for body implants. It has good corrosive resistance property and, therefore it is used in equipment for handling corrosive materials. It is also impervious (not allowing fluid to pass through) to chemical attack, for this reason it is also uses in chemical industry, as like heat exchanger in boilers where strong acids are vaporized). 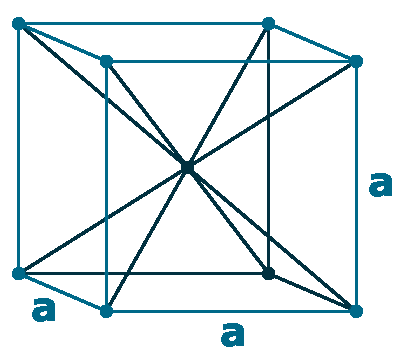 Tantalum oxide (TaO) has high index of refraction, so it is used to make special glass for camera lenses. It has also uses as electrodes for neon lights, AC/DC rectifiers, and many other uses. Tantalum alloys are extremely strong and have been used for rocket nozzles, turbine blades, missile partsand nose caps for supersonic aircraft. Tantalum carbide graphite composite material is one of the hardest materials. Its Compounds has a high melting point (3738 oC), where the metal (60%) is used to make electrolytic capacitors and vaccium furnace parts. It is non-toxic, but The NIOSH & OSHA set a recommended exposure limit of 5 mg/m3 (over an 8 hour workday), and at levels of 2500 mg/m3 (it is immediately dangerous to life & health). 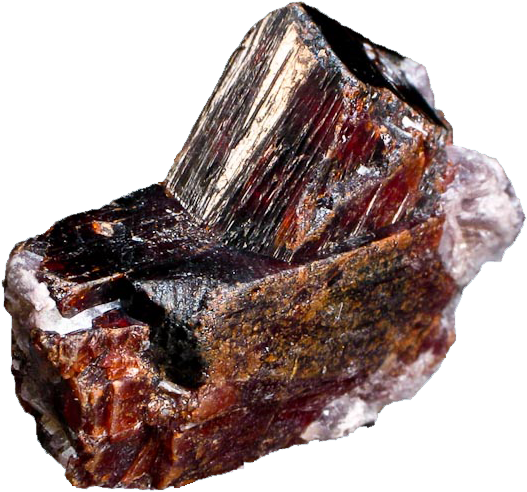 People can be exposed to tantalum by breathing, eye contact, or skin contact. 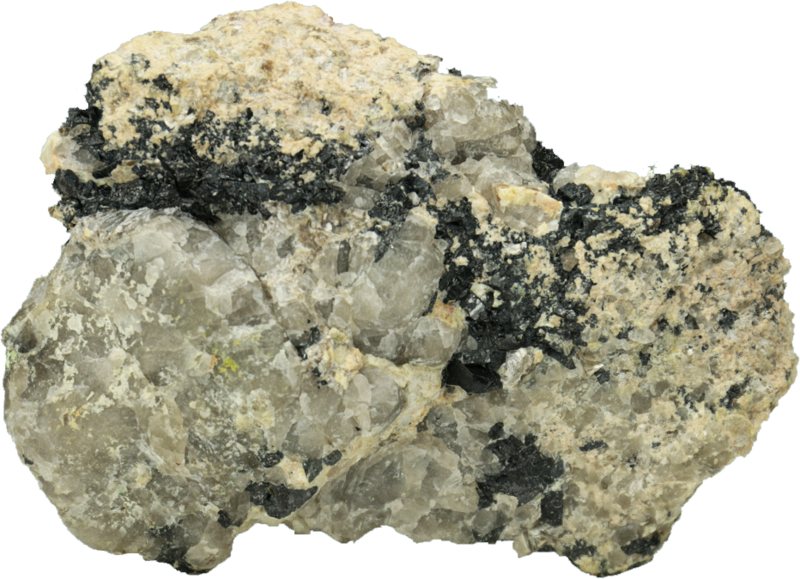 Tantalum is rarely found uncombined in nature, It occurs mainly in the mineral tantalite(Fe,Mn)Ta2O6) & columbite (Fe2+Nb2O6), which also contains other metals including niobium. There are several complicated steps require to separation of tantalum from niobium . 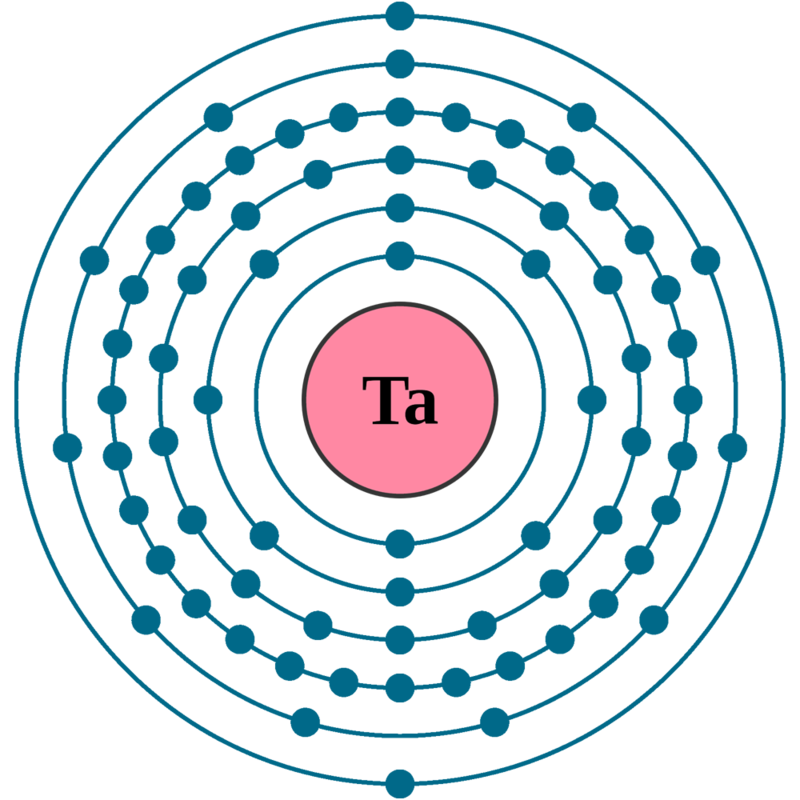 Several methods are used to produce the metal commercially by electrolysis of molten potassium fluorotantalate (K2[TaF7]), reduction of potassium fluorotantalate with sodium, or reacting tantalum carbide (TaCx) with tantalum oxide(TaO), and it is also produced as a by-product of tin extraction. Annual world wide production is around 1000 tons.